Roethlisberger is still in the process of working out a contract extension with the Steelers, Aditi Kinkhabwala of NFL Network reports. The Steelers and Roethlisberger are expected to restructure his contract before the new league year starts March 13, Adam Schefter of ESPN reports. Roethlisberger said he will return for the 2019 season, Chris Adamski of TribLive.com reports. "I have another year on my contract," Roethlisberger said Sunday. "And if No. 53 (Maurkice Pouncey) is coming back, I'm coming back." Roethlisberger completed 31 of 45 passes for 287 yards with one touchdown and one interception during Sunday's 16-13 win over Cincinnati. He also had three carries for three yards. Roethlisberger completed 33 of 50 passes for 380 yards and three touchdowns during Sunday's 31-28 loss to New Orleans. Roethlisberger completed 22 of 34 passes for 235 yards with two touchdowns and two interceptions in the Steelers' 17-10 win over the Patriots on Sunday. He also lost three yards on two rushes. Roethlisberger, who does not carry an official injury designation heading into Sunday's game against the Patriots, reportedly suffered cracked ribs in Week 14's loss to the Raiders, Ian Rapoport of NFL Network reports. Analysis: In the wake of his rib issue, which the Steelers ' official site referred to as contusions, Roethlisberger did not practice Wednesday, but was able to work fully both Thursday and Friday. As a result, his Week 15 status isn't in doubt, but the QB figures to contend with and play through a degree of discomfort until his ribs are completely healed. Roethlisberger (ribs) practiced fully Thursday. Analysis: Roethlisberger understandably dealt with some soreness after sustaining rib contusions in Week 14, but his status for Sunday's game against the Patriots is not in doubt. On the heels of three straight losses, the Steelers head into the weekend at 7-5-1, a context that makes Sunday's contest critical with regard to the team's playoff hopes. While it's known that Roethlisberger will be a go against New England, the status of top running back James Conner (ankle) remains in question. Roethlisberger (ribs) won't participate in Wednesday's practice, Ray Fittipaldo of the Pittsburgh Post-Gazette reports. Roethlisberger said Tuesday on his weekly radio show that he required an MRI for the rib injury he picked up in Sunday's 24-21 loss to the Raiders but reiterated he doesn't expect to miss time, Jeremy Fowler of ESPN.com. "I'll be on the field [Week 15 against the Patriots], that's all that matters." Roethlisberger (ribs) said following Sunday's 24-21 loss to the Raiders that "he assumes he will be good to go for (Week 15)," Jeremy Fowler of ESPN.com reports. Roethlisberger (ribs) returned to Sunday's game against the Raiders in the fourth quarter, Jason La Canfora of CBS Sports reports. Analysis: Roethlisberger was held out for nearly the entire second half because of his injury, but he returned in an effort to lead the Steelers back late in the contest. 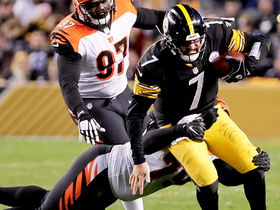 Roethlisberger was forced out of Sunday's game against the Raiders with a rib injury. 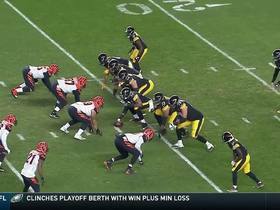 Analysis: With Roethlisberger -- who took a big hit at the end of the first half -- on the sideline, Josh Dobbs has taken over at QB for the Steelers. Prior to his exit from Sunday's contest, Roethlisberger had completed 18 of 22 passes for 164 yards and a TD. Roethlisberger completed 29 of 45 passes for 281 yards with two touchdowns and an interception during Sunday's 33-30 loss to the Chargers. Analysis: The Steelers jumped out to a 23-7 lead before the half but could have gone in to the locker room leading by more had Roethlisberger not been intercepted by safety Derwin James on a pass intended for Vance McDonald deep in Chargers territory. Big Ben has now thrown six interceptions in his last three games, losing the last two. He'll look to return to his winning ways in Week 14 against Oakland, which has allowed 28 passing touchdowns and has just nine interceptions this season. Roethlisberger completed 41 of 56 attempts, accounting for 462 passing yards, one touchdown and two interceptions during Sunday's 24-17 loss to the Broncos. He added two rushes for 18 yards on the ground as well. Roethlisberger completed 27 of 47 passes for 314 yards, two touchdowns and three interceptions, while rushing twice for one yard and a touchdown in Sunday's 20-16 win over Jacksonville. Roethlisberger completed 22 of 25 passes for 328 yards with five touchdowns and no interceptions in the Steelers' 52-21 win over the Panthers on Thursday. He also rushed three times for 27 yards and fumbled once but recovered. Roethlisberger (finger) doesn't carry an injury designation into Thursday's game against the Panthers. Analysis: Roethlisberger will thus continue to manage and work through a fractured finger on his left (non-throwing) hand when the Steelers -- winners of four straight -- take on the 6-2 Panthers. Meanwhile, Roethlisberger is coming off a Week 9 effort in which he shrugged off his aches and pains to complete 28 of 47 passes for 270 yards and two scores while adding another touchdown on the ground in a 23-16 win in Baltimore. Roethlisberger (finger) was listed as non-participant in Tuesday's practice. Roethlisberger (finger) was listed as a non-participant in Monday's estimated practice report. Analysis: The Steelers didn't actually practice Monday, but the report cites a finger issue for Roethlisberger. The QB did come out of Sunday's 23-16 win over Baltimore a little banged up, and Roethlisberger acknowledged getting the wind knocked out of him during that contest. That said, there's little doubt that he'll be a go Thursday night against the Panthers. Roethlisberger completed 28 of 47 passes for 270 yards and two touchdowns while adding four yards and a touchdown on two rushing attempts in Sunday's 23-16 win over Baltimore. Roethlisberger, who is dealing with a fractured index finger on his left (non-throwing) hand, may wear a splint during Sunday's game against the Ravens, Jeremy Fowler of ESPN.com reports. Roethlisberger (finger) practiced fully Thursday. Analysis: Roethlisberger sat out practice Wednesday, which has normally been a weekly off day for the QB. He is, however, dealing with a fractured index finger on his left hand that he suffered in Week 8's win over the Browns. It's an issue he played through in that contest, with coach Mike Tomlin noting Wednesday that he didn't anticipate the injury impacting Roethlisberger's availability for Sunday's game against the Ravens. Roethlisberger (finger) didn't participate in practice Wednesday. Coach Mike Tomlin said Roethlisberger fractured the index finger on his left hand during Sunday's 33-18 win against the Browns, Ed Bouchette of the Pittsburgh Post-Gazette reports. Analysis: Tomlin was unable to hone in on the nature of the injury Monday, but subsequent tests have confirmed that Roethlisberger has a fracture in the finger. Despite playing through it in the second half Sunday, Roethlisberger put up 257 yards, two touchdowns and one interception. While he's certain to be present on Steelers injury reports this week, there's no worry about Roethlisberger sitting out this Sunday at Baltimore. Coach Mike Tomlin noted after Sunday's 33-18 win over the Browns that Roethlisberger has an "index finger injury on his left (non-throwing) hand," Aditi Kinkhabwala of NFL Network reports. Analysis: Per the report, the QB hurt his finger in the second quarter of the game, but the issue didn't prevent Roethlisberger from carrying on and completing 24 of 36 passes for 257 yards, with two TDs and a pick. We doubt that Roethlisberger's Week 9 status is in any danger, but it remains to be seen if his practice participation in advance on next Sunday's game against the Ravens will be impacted at all. Roethlisberger completed 24 of 36 passes for 257 yards, two touchdowns and an interception during Sunday's 33-18 win over Cleveland. He also ran twice for six yards and had one fumble, which he recovered. Analysis: Big Ben connected with Antonio Brown for both scores and a 14-6 halftime lead. He then let the ground game and defense take over to give Pittsburgh a three-game winning streak. In seven games this season, Roethlisberger has thrown for 2,290 yards (327.0 yards per game) with a 14:7 TD:INT. 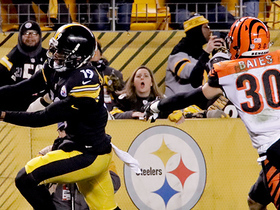 He'll look to continue Pittsburgh's winning streak against a tough Baltimore defense in Week 9. Earlier this season, he threw for 274 yards with one touchdown and one interception in a 26-14 loss to the Ravens. Roethlisberger completed 32 of 46 passes for 369 yards and a touchdown while also passing for a two-point conversion in Sunday's 28-21 win over the Bengals. 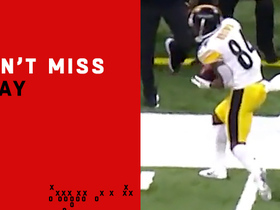 Analysis: After James Conner converted a pair of one-yard touchdowns in the first half, Roethlisberger finally recorded a passing score by hitting Antonio Brown on a 31-yard slant with 10 seconds left. Even before his game-winning toss to Brown, Roethlisberger had been racking up yardage and topped 300 for the fourth time in six games. He'll get to rest his 36-year-old bones in Week 7 with Pittsburgh on bye. Roethlisberger mentioned Tuesday that an elbow injury has impacted his throwing motion, but he downplayed the significance of the issue Wednesday, Chris Adamski of The Pittsburgh Tribune-Review reports. "Ah, it's fine," Roethlisberger said. "I don't even need to talk about it. It's good." Roethlisberger completed 19 of 29 passes for 250 yards with three touchdowns and one interception in the Steelers' 41-17 win over the Falcons on Sunday. He also rushed twice for 16 yards. Roethlisberger completed 27 of 47 pass attempts for 274 yards with one touchdown, one interception and one two-point conversion during Sunday's 26-14 loss to the Ravens. Roethlisberger completed 30 of 38 passes for 353 yards with three touchdowns and one interception in Monday's 30-27 win over the Buccaneers. He also lost one yard on four carries. Analysis: After a slow start on their first two possessions, Roethlisberger got hot, with all three touchdowns coming in the first half. Despite the 1-1-1 record, Big Ben is having an outstanding season, completing 92 of 139 passes for 1,140 yards with seven touchdowns and four interceptions. On pace for over 6,000 yards, he'll look to keep it going Week 4 against a banged-up Baltimore defense. 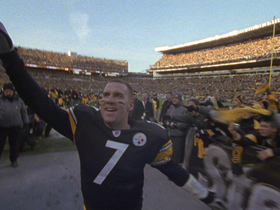 In his last game against the Ravens, a 39-38 win, Roethlisberger threw for 506 yards and two touchdowns. Roethlisberger (elbow) completed 39 of 60 passes for 452 yards and three touchdowns and added a touchdown and nine yards on two carries during Sunday's 42-37 loss to Kansas City. Roethlisberger (elbow) is active for Sunday's game against the Chiefs, Dale Lolley of DKPittsburghSports.com reports. Roethlisberger (elbow) is expected to play in the Steelers' Week 2 game against the Chiefs, Dianna Russini of ESPN reports. Analysis: Although Roethlisberger was a full participant at Friday's practice, he was still given a questionable status for Sunday's game. It looks like the team was just erring on the side of caution with the designation, as he is fully expected to play at this point. Josh Dobbs would be in line to replace him under center should he ultimately suffer a setback. Though listed as a full practice participant Friday, Roethlisberger (right elbow) is marked questionable for Sunday's game against the Chiefs. Analysis: Per Jermey Fowler of ESPN.com, the expectation is that Roethlisberger will play Sunday, but the questionable designation makes it imperative for those inclined to use the QB in Week 2 lineups to confirm his status in advance of Sunday's 1:00 PM ET kickoff. Josh Dobbs, who returned to his normal backup workload Friday after taking first-team reps Wednesday and Thursday, is on hand in the event that the Steelers surprisingly elect to sit Roethlisberger this weekend. Coach Mike Tomlin relayed that Roethlisberger (elbow) was a full practice participant Friday, Adam Schefter of ESPN reports. Analysis: Meanwhile, per Jeremy Fowler of ESPN.com, Josh Dobbs, who took first-team QB reps Wednesday and Thursday, returned to his normal practice workload Friday, which sets the stage for Roethlisberger to start Sunday's game against the Chiefs. Roethlisberger (right elbow) was present for practice Friday, Chris Adamski of TribLive.com reports. Analysis: We'll await the Steelers' final injury report of the week, which will clarify Roethlisberger's level of participation and official Week 2 designation. Chances are, the QB will be listed as questionable for Sunday's game against the Chiefs, but his presence on the field Friday is a positive indicator on that front. Roethlisberger (elbow) missed practice again Thursday, Jeremy Fowler of ESPN.com reports. Analysis: Roethlisberger previously said that he doesn't expect his bruised right elbow to sideline him for Sunday's game against the Chiefs, but his return to practice in any capacity Friday would certainly boost our optimism on that front. With Roethlisberger sidelined for the second consecutive day, Chris Adamski of TribLive.com relays that Josh Dobbs took the bulk of the Steelers' first-team QB reps Thursday. Roethlisberger doesn't expect his bruised right elbow to sideline him for Sunday's game against the Chiefs, Jeremy Fowler of ESPN.com reports. Analysis: The quarterback didn't practice Wednesday, but it's not unusual for him to get maintenance days during the season, particularly when he's banged up. The Steelers will update Roethlisberger's status again Thursday, but so long as he practices by the end of the week, he should be ready to play come Sunday. Roethlisberger admitted Wednesday that he's dealing with a bruised right elbow, but wouldn't confirm if he underwent an MRI earlier in the week, Ray Fittipaldo of the Pittsburgh Post-Gazette reports. Roethlisberger sustained a minor elbow injury in Sunday's 21-21 tie against the Browns and could be limited in practices this week, Ed Bouchette of the Pittsburgh Post-Gazette reports. Roethlisberger completed 23 of 41 pass attempts for 335 yards, one touchdown and three interceptions Sunday against the Browns. He also carried three times for 16 yards and lost a pair of fumbles in the 21-21 tie. Roethlisberger completed 11 of 18 passes for 114 yards and one touchdown during Saturday's preseason game against the Titans. Roethlisberger is on track to play in Saturday's preseason game against the Titans, ESPN's Jeremy Fowler reports. Roethlisberger did not suffer a concussion in practice Tuesday, Adam Schefter of ESPN reports. Analysis: Roethlisberger was evaluated by team doctors as part of the NFL's concussion protocol, but subsequently cleared. His absence from Thursday night's preseason game against the Packers was planned and the QB is slated to play next Saturday against the Titans. Roethlisberger was removed from the NFL's concussion protocol Wednesday, Gerry Dulac of the Pittsburgh Post-Gazette reports. Analysis: The Steelers were planning to hold Roethlisberger out of Thursday's preseason game against the Packers in any case, but now that he's medically cleared, the veteran signal-caller could see some snaps in the team's third exhibition game Aug. 25 against the Titans. With Landry Jones also not in line to play this week, the Steelers plan to turn things over Thursday to young quarterbacks Mason Rudolph and Joshua Dobbs. Roethlisberger (concussion) traveled with the Steelers in advance of Thursday's preseason contest at Green Bay, Dale Lolley of DKPittsburghSports.com reports. Analysis: Roethlisberger was evaluated under the NFL's concussion protocol after banging his head on the ground at Tuesday's practice, which left him laying on the turf for multiple minutes. Just one day later, though, he got the all clear to travel, indicating he didn't actually enter the protocol. The Steelers likely will be prudent with their starting quarterback and hold him out Thursday, but Wednesday's development opens the door slightly that an appearance is possible. 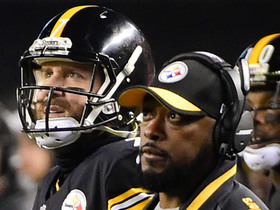 Coach Mike Tomlin relayed that Roethlisberger, who sustained a hit in practice Tuesday, is being evaluated by team doctors as part of the NFL's concussion protocol, Steelers Director of Communications Burt Lauten reports. Analysis: Roethlisberger is thus day-to-day for now and we won't see him in a game before Aug. 25, when the Steelers host the Titans in their third preseason contest. Roethlisberger was removed from Tuesday's practice, possibly to be evaluated for a concussion, Jeremy Fowler of ESPN.com reports. Analysis: Roethlisberger appeared to bang his head on the ground during practice, then touched his head a few times while talking with the Steelers' training staff. He's suffered three reported concussions in his pro career, with the most recent coming in November 2015 and not requiring any absences beyond the game in which he suffered the injury. The Steelers were already planning to hold Roethlisberger out for Thursday's preseason game against the Packers. Roethlisberger isn't in line to play Thursday night against the Packers, the Pittsburgh Post-Gazette reports. Analysis: That's nothing unusual, as the Steelers are wisely limiting Roethlisberger's exposure to preseason contact with the grind of the regular season in mind. Meanwhile, backup Landry Jones isn't expected to see a ton of preseason action, which sets the stage for the team to get longer looks at youngsters Mason Rudolph and Josh Dobbs. Roethlisberger won't play in Thursday's preseason game against the Eagles, Dale Lolley of DKPittsburghSports.com reports. Analysis: Landry Jones will get the start, while Josh Dobbs and Mason Rudolph figure to get most of the playing time. Roethlisberger seems to be enjoying a healthy training camp, but the same can't be said of his receiving corps, with Antonio Brown (undisclosed), JuJu Smith-Schuster (knee) and Vance McDonald (foot) all missing practice time. Roethlisberger was held out of Friday's practice session, Dale Lolley of DKPittsburghSports.com reports. Analysis: Roethlisberger was on the field for Friday's practice but wasn't suited up as a participant. He was likely just getting a veteran rest day, as the Steelers haven't given any notice of an injury. There won't be any cause for concern unless Roethlisberger is also held out of practice over the weekend. Roethlisberger lost a noticeable amount of weight during the offseason, Aditi Kinkhabwala of NFL Network reports. Roethlisberger said he plans on playing for 3-to-5 more seasons if both he and his offensive line stay healthy, Ed Bouchette of the Pittsburgh Post-Gazette reports. Steelers owner Art Rooney II said Wednesday that Roethlisberger wants to keep playing in the NFL beyond the 2019 season, the final year of his current contract, Ed Bouchette of the Pittsburgh Post-Gazette reports. Following Sunday's playoff loss to the Jaguars, Roethlisberger indicated that he plans to play in 2018, ESPN's Katherine Terrell reports. "I don't know about contracts and whose coming back but I know the guys up front are, and that makes it good for me, so I look forward to next year with those guys," Roethlisberger noted Sunday. Roethlisberger completed 37 of 58 passes for 469 yards, with five touchdowns and one interception in Sunday's 45-42 AFC divisional-round loss to Jacksonville. He also ran twice for 16 yards and fumbled once. 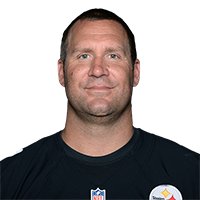 Roethlisberger was inactive (coach's decision) for Sunday's 28-24 win over the Browns, finishing the 2017 season completing 360 of 563 passes for 4,251 yards and 28 touchdowns, with 14 interceptions in 15 games. He also ran 28 times for 47 yards. Roethlisberger (coach's decision) is inactive for Sunday's game against the Browns, Bob Labriola of the Steelers' official site reports. Analysis: There had been rumblings over the last few days that Roethlisberger would be held out of the regular-season finale, but the team never offered confirmation on that front until releasing its inactive list Sunday. With Roethlisberger in street clothes, Landry Jones will make the fifth NFL start of his career, while rookie Joshua Dobbs acts as the backup quarterback. The Steelers will rest Roethlisberger and a number of key starters Sunday against the Browns, Ian Rapoport of NFL Network reports. Roethlisberger (non-injury) was held out of practice Friday but doesn't have a designation for Sunday's game versus the Browns. Roethlisberger (non-injury related) was listed as a limited participant in Thursday's practice. According to Tim Benz of TribLive.com, Steelers offensive tackle Marcus Gilbert suggested that Roethlisberger won't play Sunday against the Browns, though head coach Mike Tomlin has yet to confirm as much. "Ben's not there [Sunday] so [Cleveland will] get a little taste of [backup quarterback] Landry Jones," Gilbert noted. "We'll have Landry Jones in there. We won't have Ben. Or [Antonio Brown (lower leg)]. Or Le'Veon Bell." Roethlisberger completed 20 of 29 passes for 226 yards and two touchdowns in Monday's 34-6 win at Houston. Roethlisberger completed 22 of 30 passes for 281 yards with two touchdowns and one interception in Sunday's 27-24 loss to the Patriots. He also rushed three times for 10 yards and fumbled once but recovered. Roethlisberger completed 44 of 66 passes for 506 yards and two touchdowns during Sunday's 39-38 victory over the Ravens. He added five rushing yards on one carry. Roethlisberger completed 24 of 40 passes for 290 yards, two touchdowns and an interception in Monday night's 23-20 win over the Bengals. Roethlisberger completed 33 of 45 passes for 351 yards, four touchdowns and two interceptions during Sunday's 31-28 victory over Green Bay. He added 25 yards rushing on three carries. Roethlisberger was a full practice participant Wednesday despite feeling under the weather, Mark Kaboly of DKPittsburghSports.com reports. Analysis: Coming off his best performance of the season last week, Roethlisberger apparently is dealing with a minor illness. He wasn't even listed on Wednesday's injury report, and it can be assumed this is a non-issue if he isn't added to the report Thursday. Roethlisberger and the Steelers will face a struggling Packers squad on Sunday Night Football. Roethlisberger completed 30 of 45 passes for 299 yards with four touchdowns and no interceptions in Thursday's 40-17 win over the Titans. He also rushed once for 10 yards. Roethlisberger completed 19 of 31 passes for 236 yards with two touchdowns and one interception in Sunday's 20-17 win over the Colts. 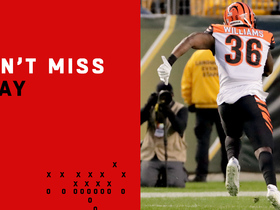 He also rushed twice for five yards and completed a two-point conversion pass. 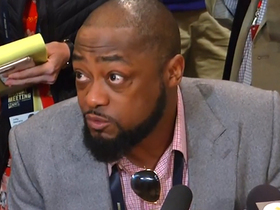 Pittsburgh Steelers head coach Mike Tomlin addresses critiques on quarterback Ben Roethlisberger says "I have no problem with his leadership." 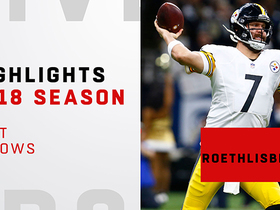 Find out why Pittsburgh Steelers quarterback Ben Roethlisberger is one of the best of all time in this career highlight video. Listen to Pittsburgh Steelers head coach Mike Tomlin and quarterback Ben Roethlisberger in the midst of their comeback win against the Denver Broncos in Week 15. Watch Pittsburgh Steelers quarterback Ben Roethlisberger's best throws in 2018. Cincinnati Bengals safety Shawn Williams intercepts a pass from Pittsburgh Steelers quarterback Ben Roethlisberger and runs it in for a touchdown. Pittsburgh Steelers quarterback Ben Roethlisberger passes 5,000 passing yards for the season on a 47-yard pass to wide receiver James Washington. Cincinnati Bengals defensive end Christian Ringo sacks Pittsburgh Steelers quarterback Ben Roethlisberger. 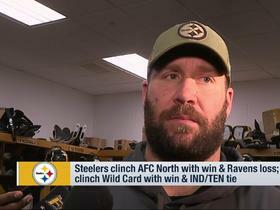 Pittsburgh Steelers quarterback Ben Roethlisberger talks about his mentality heading into Week 17. Pittsburgh Steelers wide receiver Antonio Brown pulls in a sensational 19-yard grab on the sideline to convert a fourth down.